I'm Here. I'm Queer. What the Hell do I read? : My first editorial trade review of "Queer as a Five-Dollar Bill" will be in Foreword Reviews! My first editorial trade review of "Queer as a Five-Dollar Bill" will be in Foreword Reviews! The review publishes in the September/October 2018 issue of Foreword Reviews. 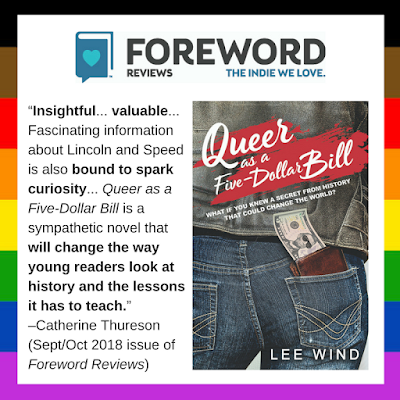 Lee Wind’s insightful Queer as a Five-Dollar Bill follows fifteen-year-old Wyatt as he comes to terms with his sexual orientation, thanks to the surprising revelations of a class assignment on Abraham Lincoln. Wyatt is gay, but he does not want anyone to know. He is certain that he will not find acceptance in his small Oregon town. He is assigned to create a blog focused on letters written between Abraham Lincoln and a friend, Joshua Fry Speed. Based on the letters’ content, Wyatt comes to believe that Lincoln and Speed were romantically involved. If he can convince others that Lincoln—a treasured national hero—was gay, then maybe he will not have to hide his own truths. Wyatt’s fear and isolation come across clearly; the book is valuable for that alone. Fascinating information about Lincoln and Speed is also bound to spark curiosity. Though the book is a work of fiction, the documents that Wyatt reads are all real, and the book includes references for continued learning. Queer as a Five-Dollar Bill is a sympathetic novel that will change the way young readers look at history and the lessons it has to teach.